The CM-TBU line-powered telephone balance unit is compatible with all analogue direct exchange lines and provides a 4-wire communications system to interface with the telephone network. The high degree of separation between send and receive signals makes it suitable for use in telephone IFB (interrupted foldback) applications and the high drive capacity at the 4-wire output enables a presenter’s earpiece to be connected directly to the unit without an external amplifier. This extremely compact unit is powered from the telephone line and provides an interface to a 4-wire circuit with separate level control of send and receive signals. Optimum rejection of the input signal on the 4-wire output is achieved in a bridge circuit by adjusting three elements (NULL, R-BAL and C-BAL) via potentiometers which simulate the complex line impedance. This can be used to compensate for local line variations or to adapt to the telephone systems of other countries, where line characteristics may differ. Optimization of the sidetone rejection does not involve the use of any test equipment and can be easily carried out while the system is in use. Although the signal level being sent to the line can be manually adjusted using the ‘SEND LEVEL’ control over a wide range, the level control is followed by a limiter that prevents the telephone line signal level becoming overloaded or distorted. The limiter drives a ‘LIMIT’ LED to indicate the onset of limiting. Although the output stage can drive a presenter’s earpiece in a telephone IFB application, the ‘RECEIVE LEVEL’ control may not be accessible to the presenter, who is normally situated some distance from the unit. The presenter may then require a local control of the earpiece signal level. The CM-TBU can be used to supply the correct signal level to a suitable battery powered earpiece belt-pack unit. To enable communication between the 4-wire circuit and the telephone network, once the 4-wire and telephone line cable connections are made to the unit, the ‘LINE CONNECT’ switch can be pressed to power the unit from the line. This is indicated by the ‘ON’ LED, and can either be done after an outgoing call has been dialled on a telephone set connected to the unit, or to answer an incoming call after the ‘RING’ LED is seen to flash. Note that a telephone set is not required for incoming calls unless an audible ring is required. If the sidetone level at the 4-wire output is found to be excessive, the outgoing signal level can be reduced usingthe ‘SEND LEVEL’ control or the balance controls can be adjusted to minimize it. The unit is supplied with a connector and cable kit that enables connections to be made to both UK Telecom or the universal RJ11 sockets used in most telephone networks around the world. 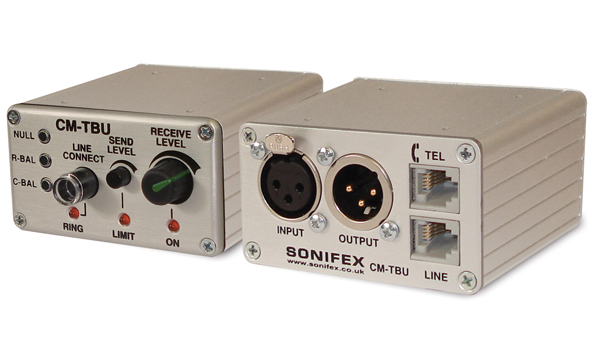 Isolated, full-duplex 4-wire interface to direct non-digital telephone exchange lines. Line powered, requiring no battery or external power. Simple optimization of sidetone rejection with any country’s telephone system. LEDs indicating ‘Ring’, ‘Line Hold’ and ‘Limit’ conditions. Input level control with line-sensing limiter and limit indicator. High drive output with level control for direct feed to presenter’s earpiece, etc. Loop-through RJ11 line sockets provide universal connection to line and telephone set. Connection to the telephone set is maintained while the unit is in use. Small, rugged extruded aluminium case with XLR3 male & female 4-wire connectors.